(Darkhawk#47 (fb), 45-47 <all BTS) - Darkhawk was injured and was sent to the dimension of Kahesha to retrieve some of its crystals, which when exposed to the atmosphere of the another extradimensional planet, Jormal, would generate energies that would heal his android form. When Darkhawk returned to Earth, he was still not completely healed, and so he bound several of the energized crystals to his body to continue the healing process. Once on Earth, he was attacked by a squad of the Mahari while in Madison Square Park. In the course of the battle, the Crystals were blasted off of his body, and he was forced to leave them behind. (Spider-Man: Friends and Enemies#1) - The seven crystals were found by five teenagers attending a Channel Surfers concert in Madison Square Park. Two criminals, Elias Flynn and Carl Hollister, snatched two of the crystals from them, and then tried to buy the rest from them. The Crystals released a burst of energy, to no apparent effect. The seven then went their separate ways, but over the course of the day they each discovered that they had gained superhuman powers from the energy released. The teenagers and Carl--who each had some connection to the rest of the group--all met back up in the Park, but Flynn, who had gained mind control powers, arrived as well as took control of the others. He forced them to bring all of the crystals to him, and then brought the group--his metahumans, or Metahumes--to the Paradeen manor, where he had them practice their abilities. Darkhawk returned to Earth and looked for the amulets, but found them missing. He contacted his friends, Nova and Speedball, and convinced them to help him find the crystals. 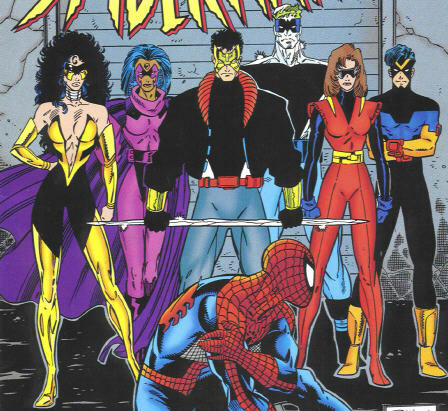 They ran into Spider-Man, who agreed to help when he found out the crystals had given the youths powers. (Spdm: F+E#2) - Flynn forced the group--now sporting costumes and codenames--to rob a bank in Rockefeller Center. They followed his orders and escaped into a helicopter he had purchased, which contained radar-jamming devices. Edward Wong, Assault, tried to use his mental powers to break Flynn's control, but Carl interrupted the attempt. Flynn tried to sell the kids to a man, Mr. Carson, for 5 million a piece, plus ten million for the crystals. Carson tried to steal the kids, backed by the power of the Seekers, but the Metahumes overpowered the Seekers and Carson's regular enforcers. Spidey and his amazing friends tracked down the kids and tried to free them from Flynn's controls. However, they were forced to stop fighting and let them go when Carl threatened to snap two innocent kid's necks. (Spider-Man: Friends and Enemies#3) - As the group returned to Paradeen manor, the Hostiles blasted Flynn from behind, disintegrating him. The other Metahumes realized they were free and turned against Carl, but were quickly confronted by the Hostiles, who revealed that they taken their families hostage to force their cooperation. Darkhawk tracked the Hostiles' camouflaged ship, while the other heroes followed the mental advice of Assault to locate and free the Hostiles' hostages. The Metahumes were placed in energy tanks and the Hostiles began to drain their power. The Spidey-friends tried to stop them, but were again forced to stand down when the Hostiles threatened to electrocute the Metahumes. The Hostiles forced the four heroes to enter the stasis tanks as well. (Spider-Man: Friends and Enemies#4) - Recognizing some of the processes going on around him and realizing that if he didn't act that they would all die, Spider-Man broke out of his stasis tank, and then he and his allies broke the Metahumes out as well. As the Hostiles tried to keep them in line with continued threats to their families, the Metahumes decided that the best way to be free from them was to kill them. Wishing to stop the new kids on the block from heading down a dark path, Spidey and the terrific trio stepped in their way. It was at that time that the crystals reacted to the energies to which they had been subjected. The crystals evolved and grew rapidly, absorbing the Hostiles into themselves and combining into a gigantic crystalline form. 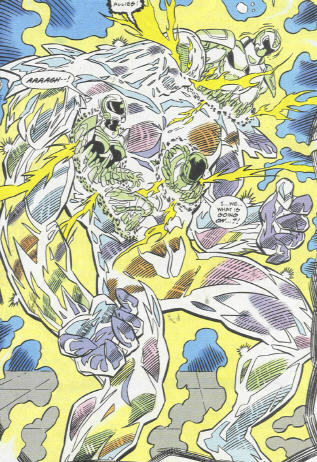 This form attacked all ten superhumans, and nothing they did seemed to have any lasting effect on the crystalline composite creature--until Darkhawk channeled his own energies into it, causing it to release the Hostiles, and revert back to the seven crystals it had been. The crystals used their remaining energies to return to their own world, and the Hostiles had died at the moment of their absorption by the crystalline creature. Spidey's kooky quartet kept the Metahumes out of the police reports, since any crimes they had committed were while under Flynn's control. The Metahumes weren't sure where to go from here. Well, five of them weren't: Carl left the team. The rest of the group headed off to unknown parts. COMMENTS: Created by Danny Fingeroth and Ron Lim. Metahumes--To paraphrase Comic Shop Guy: "Worst name ever!" Want to see more Metahumes? Write to Nel Yomtov and tell him...well, actually, do that back in 1995! I'm guessing the response to the request for more of the group was less than spectacular. While the series wasn't bad, it also was kind of...blah. I'm fairly certain that this mini-series took place b/t New Warriors I#50 and 70, meaning that it was not actually Speedball (Robbie Baldwin) who guest-starred in it, but rather Darrion Grobe, who had traveled back in time, duplicated Baldwin's powers and appearance, transferred his own mind into this duplicate (which believed itself to be the original) and replaced Baldwin in the New Warriors. How does this affect the story? It doesn't, but it is worth noting. Ed possesses telepathic powers. He could easily transmit his thoughts to others, and even could free another's mind from outside control. He could read minds (although the Hostiles must have had some sort of dampener, or Ed forgot to read their minds. 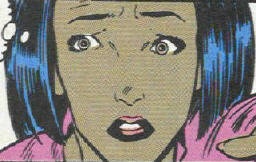 The use of his powers caused an intense headache in the recipient. Assault is pictured above in-costume on the far right. She met the others for the first time at the concert. She was employed a the Flap clothing store in the East Village. Her aunt was kidnapped by the Hostiles, possibly meaning she had no closer relatives. Barb can fire heat beams from her eyes. Blazeye is pictured above in-costume on the far left. He was a career criminal, and worked with Elias Flynn before developing powers. He quit the group after Flynn had died and the Hostiles were defeated. He told them that they'd meet again, but Alex (Hardnose) figured it would be on opposing teams. His mother was kidnapped by the Hostiles. Carl can turn into a diamond-hard, fully mobile form, with superhuman strength (Class 25?) and durability. As he grew more angry, he also grew crystalline projections from his body. Diamond Hammer is pictured above in-costume third from the right. He was old friend with Ed Wong, although they had had some problems in the past. He lived in the Bronx, was a Trekkie, and had an unnamed sister. Al can generate large amounts of crystal and shape and manipulate it as he saw fit. He could form moving waves on which he could travel, form barriers and weapons, etc. (Civil War: Battle Damage Report) - Tony Stark considered Hardnose as a potential Initiative recruit. Hardnose is pictured above in-costume third from the left. She lived in midtown Manhattan and was friends with Fiona (Makina). Her mother was kidnapped by the Hostiles. Denise can fire concussive energy blasts from her hands. Hyperia is pictured above in-costume second from the left. She lived in Staten Island and was friends with Denise (Hyperia). Her ex-husband was kidnapped by the Hostiles. Fiona can control mechanical and electronic equipment. Makina is pictured above in-costume second from the right. Flynn was a former member of the Hostiles, but left for reasons unknown. He went to work with Carl Hollister, working as con-men and criminals. He quickly recognized the potential value of the crystals and tried to get them all for himself. After learning that he had gained mental powers he took control of the other six metahumans, organized them into his Metahumes, and forced them to rob a bank. He was enjoying his new power and making bigger plans for the future when one of the Hostiles blasted him from behind, incinerating him. Flynn could mentally control others, even small groups. 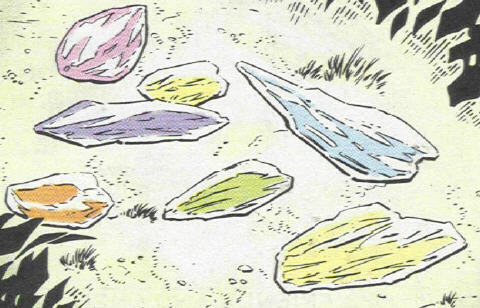 The crystals originated on the extra-dimensional planet of Kahesha, and were energized by the atmosphere on the extra-dimensional planet of Jormal. They released an energy which repaired Darkhawk's android body. On earth, they released a pulse of energy which empowered Flynn and the Metahumes. When they were further stimulated by the Hostiles, they evolved and merged into a collective entity, which then slew and absorbed the Hostiles. The entity attacked the heroes, making claims of remaking the universe and solving all of its problems. The heroes didn't buy it, and they fought back against the entity. Darkhawk's energy beam forced it to split back into the seven crystals, expelling the now dead Hostiles. The crystals used their remaining energy to return to their home (presumably Kahesha), and communicated this info to Ed (Assault). Unknown origins and means. They sought power and money for their own sakes. Honcho (aka Number One) was their leader, and Flynn was one of their former members. The remaining head members, two men and a woman, were unnamed. They were based out of an office in a midtown Manhattan skyscraper. Another five Hostiles worked out of a warehouse in SoHo (South of Houston), and they guarded the Metahumes' families. The nine Hostiles wore exoskeletons which may have been Guardsman-derived. They also possessed hovercrafts equipped with camouflage technology. They once used a disintegrator beam, and one of the other five Hostiles was seen carrying a hand-held energy gun. The armor of the head Hostiles contained an infrared scanning device, and they could fire wide-range pulse beams. 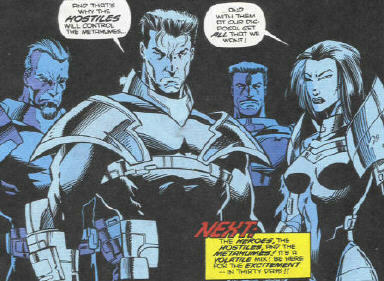 The armor of the other five Hostiles did not seem to supply a boatload of power, as even Speedball made short work out of a pair of them--or possibly the other five just didn't know how to use the suits. After Flynn organized the Metahumes, the four head Hostiles were seen to have been monitoring his activities. They incinerated Flynn and forced the Metahumes to obey them by taking their families hostage. They then brought the Metahumes to their West Side base, where they began to drain their powers. The heroes stormed the base, but were forced to surrender when Honcho threatened to electrocute the Metahumes. When the heroes broke free, the Hostiles told them they still knew who their families were, and could still harm them. Another of the Hostiles subjected the crystals to various forms of energy, which caused the crystals to evolve and mutate into a giant creature which absorbed and slew the four head Hostiles. The creature was eventually split back into the crystals, and it disgorged the Hostiles in the process--but they were all dead. 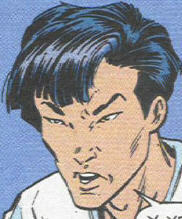 Edward Wong (Assault)'s brother Phil, who also appeared in Spider-Man: Friends and Enemies#1. 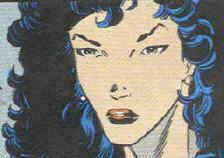 Denise Haven (Hyperia)'s mother, who also appeared in Spider-Man: Friends and Enemies#1. Carl Hollister (Diamond Hammer)'s mother.